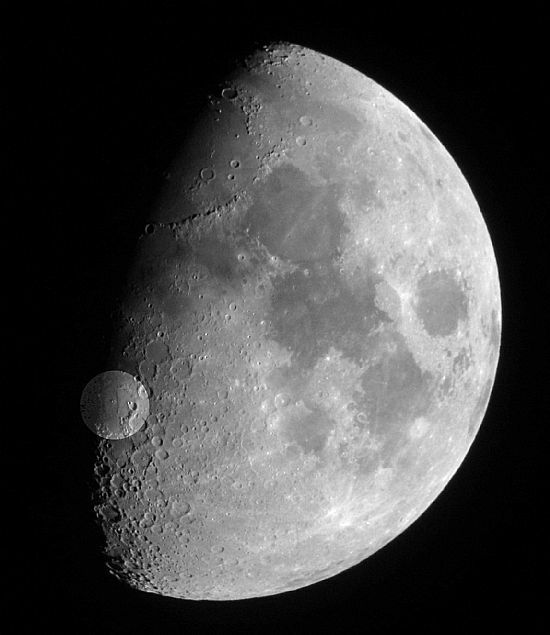 “Whole-face” images of the Moon using digital cameras. 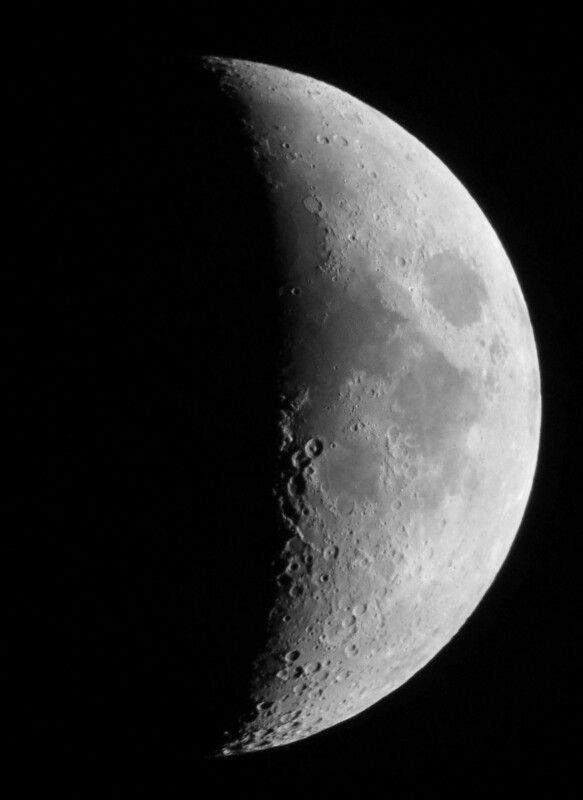 The Moon is both relatively simple and rewarding to image with basic digital cameras. A combination of large zoom and image stabilizers allows one to achieve hand-held camera images of fair quality, even on auto settings. However, imaging through the telescope or a large binocular can prove more problematical. One requires focal lengths of at least 600mm in order to achieve moderate, detail especially for medium and smaller craters. Imaging through the eyepiece can be relatively easy with some cameras with smaller diameter lenses but it can often be a hit and miss affair. Single lens reflex (SLR) cameras, on the other hand, are not suitable for use with a telescope even if you have the necessary lens attachment to enable the camera to be mounted at the prime focus. Not only is the image small, compared to when magnified via an eyepiece, but also the camera mechanism will transmit vibrations from the shutter release, unless the apparatus is mounted on a very sturdy tripod. 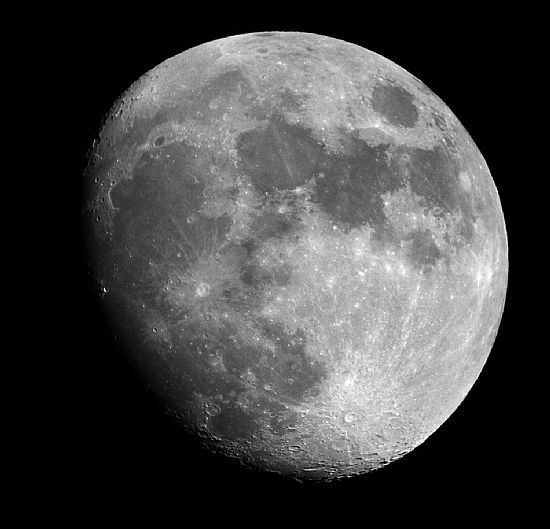 For “whole” image photography of the Moon we have tended to achieve by photographing though the telescope eyepiece using small, handheld cameras. More recently we have used Nikon (Nikkor) 600mm and 800mm manual telephoto lenses attached to a heavy-duty EQ6 equatorial mounting. These lenses, when stopped down to f/16 with above average ISO settings, can give fine, detailed images at shutter speeds of around 1/500 second. An example is given below using a 800mm focal length lens in combination with a 2x converter. It is possible to pick up S/H such lenses at prices well below equivalent aperture apochromatic triplet telescopes. 2014 September 11, 22h 45m UT. Nikkor 800mm f/5.6 with 2x converter and stopped down to f/11. A 1/500 sec. exposure D300 SLR ISO 2000. 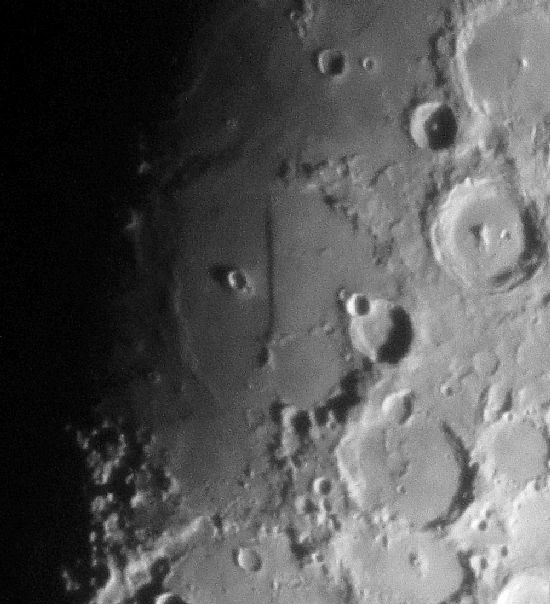 Note the sharp, bright image of crater Proclus close to the western limb. (Left click to enlarge.) Note: Some loss of detail in this medium resolution image. We occasionally receive requests for specific information via the Guestbook page, by email and by telephone. One query that has cropped up a number of times over the years refers to a bright “spot” on the near-full Moon visible to the unaided eye. 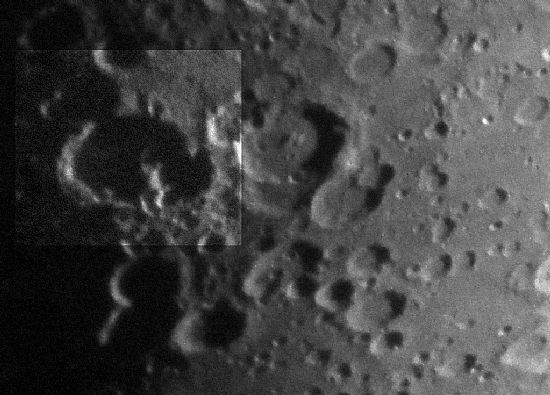 The “spot” referred to is seen close to the terminator (image below) and is in fact the crater named after the revolutionary observer and thinker Aristarchus. 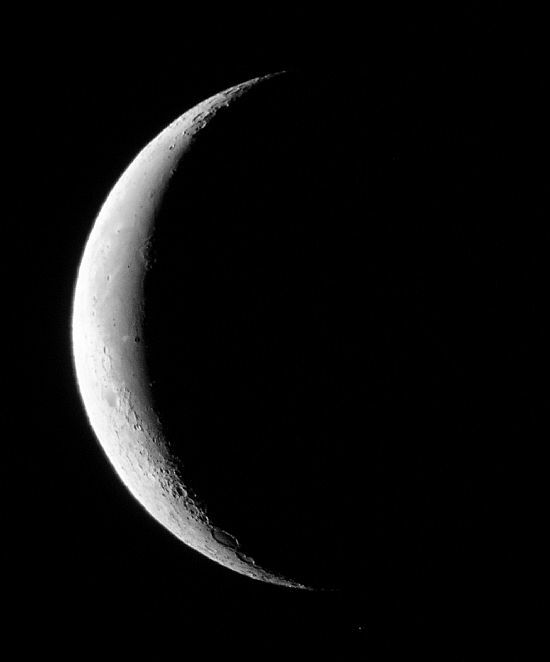 This crater is the brightest feature on the lunar surface and may be glimpsed when the Moon is in the early first quarter phase and Aristarchus is lit not by direct sunlight but by sunlight reflected via the Earth (the so-called earthshine). A finer view is shown in the image on this page for 2013 January 23, 20h 23m UT. 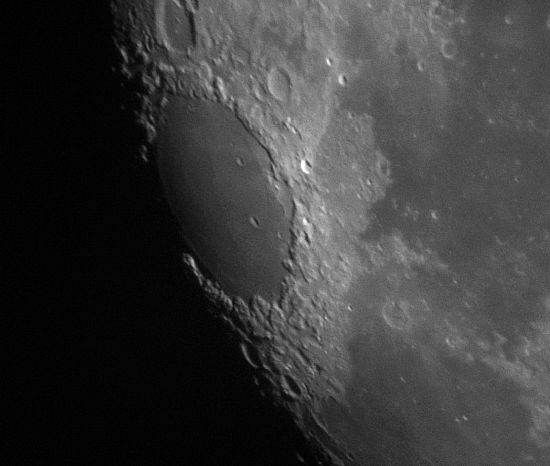 Another interesting crater close by is Herodotus. Readers may be interested to look these two names up online for more information on the persons themselves. We discussed this formation in connection with an observation made on January 09 this year (see below) using a modest 100mm f/9 apochromatic doublet. Compare the data for the two observations. It will be seen that the phase for May 07 is considerably less than for January 09, making for more tricky exposure times etc. 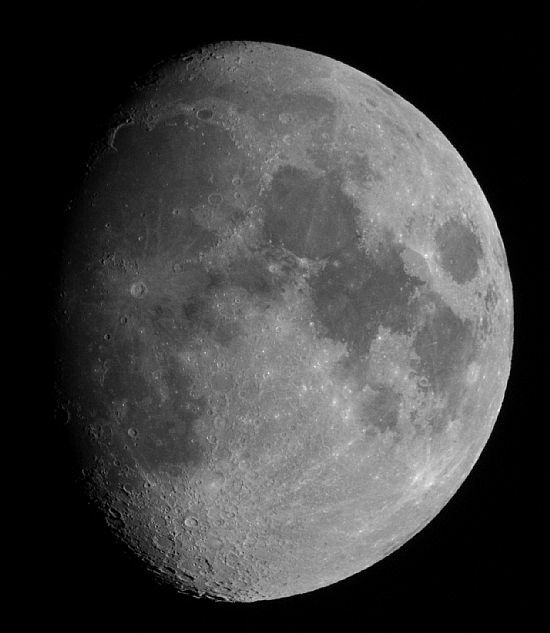 A brief period of clear sky in the late evening of May 07 gave promise of good, steady seeing and excellent transparency. As we have mentioned, astronomical twilight now lasts throughout the 24 hour period here in Orkney and so this limits us somewhat where the observation of faint objects is concerned (galaxies and comets for example). It was the intention to re-collimate the 200mm f/8 Ritchey Chretien and so waiting for fading twilight that would allow the observation of stars to magnitude 3 or thereabouts, we filled in the time observing the Moon with a 180mm f/15 Maksutov. 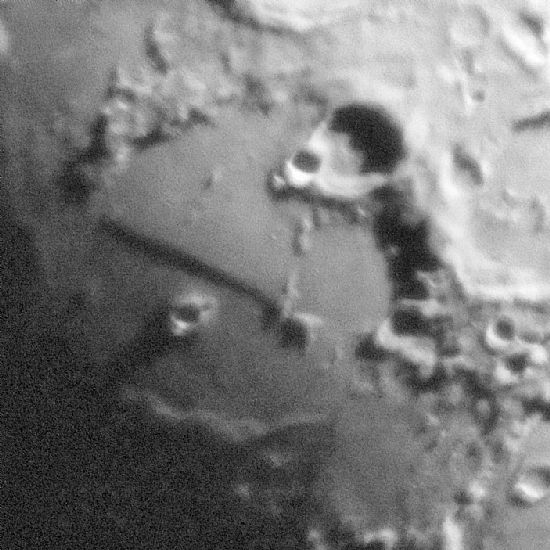 This evening afforded another promising opportunity to have Rupes Recta close to the terminator. Illumination is always weak on the light side close to the terminator affording some difficulty recording this feature with modest equipment. Moreover, the lunar phase is critical for shadow effects best suited to show up the delicate nature of the surrounding area and the scarp (“wall”) itself. 2014 May 07, 20h 33m. 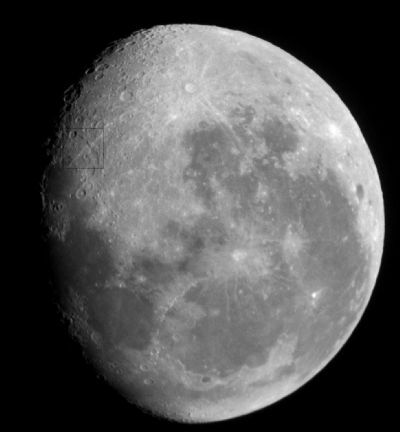 180mm Maksutov 360x, imaged through the eyepiece using a Cannon IXUS 310 HS small digital camera. Exposure 1/80 sec. ISO 800. The Moon whilst waiting for the Aurora! 2014 January 09. Lunar Observations with 100mm f/9 apochromatic doublet. Mount: SkyWatcher EQ3: manual drive in R.A. Camera Canon IXUS310 exposures through the eyepiece (20mm & 12mm) from 1/200 to 1/500 sec ISO 800. 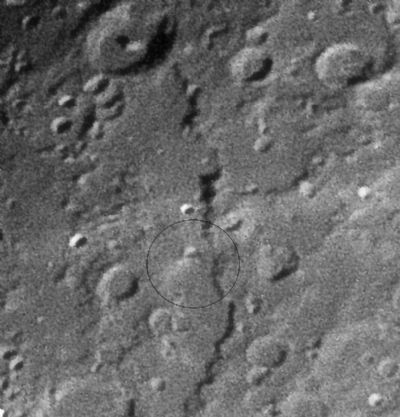 Full disc shows Rupes Recta area circled and highlighted. The SkyWatcher 100mm f/9 apochromatic refracting telescope would be the telescope I should recommend to an advanced beginner to observational astronomy. Prior to that, I would have suggested a good pair of binoculars (8x40) and for the owner to become well acquainted with the night sky—this would include an understanding of diurnal and annual motions in order to account for the seasonal appearance of the constellations, the apparent motion of the Moon and so on. I graduated from the smallest to some of the largest refracting telescopes, and at each stage managed to cover a comprehensive programme of work on double stars. Between times I would view the Moon and planets where appropriate. 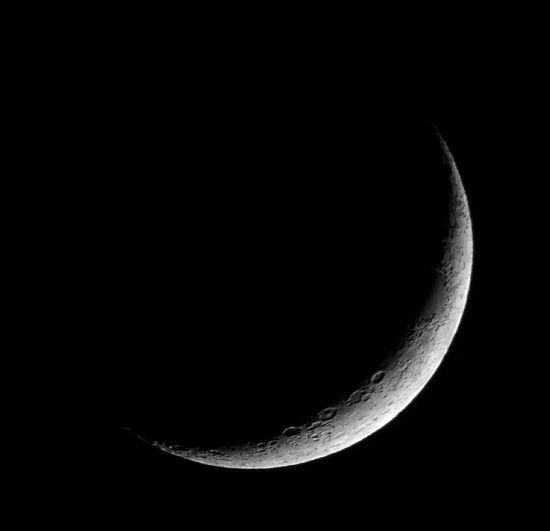 The Moon tended to excite me the most for its vast range of detail that was ever changing. Leading up to the evening and night of January 9th this year there had been a good deal of general media coverage for an anticipated display of the aurora. The Sun had been showing a good deal of activity in many regions both visual and in other ranges of the spectrum. The first really large sunspot group (large enough to be seen with the eye using filters for protection) of the current solar maxima had been on disc since January 1st. A few days later we had further indications that an aurora might be seen over the forthcoming nights. The main obstacle to viewing the aurora, apart from interference from cloud, was the waxing Moon at a phase of 68%+ on the evening and night of the 9th. Predicting an auroral display is by no means an easy exercise; in addition to observational data from telescopes and magnetometers, a certain amount of judgement is required, and this can only be achieved through long experience in the field. Frankly, we put the chances of an outstanding display at less than 50%. On the night there was plenty of fast moving cloud to accompany the Moon well placed for observation in Aries at declination +13°.5 and therefore well above the celestial equator—far from ideal auroral watch stuff. The cloud remained broken for much of the early night carried, as it was, on a strong NW wind. This provided a good opportunity for some “recreational” lunar observing with the 100mm refractor, whilst at the same time keeping an eye on the northern sector of sky for any signs of the aurora. As the wind eased so the cloud cover became more extensive before midnight—time to call it a day! However, the Lunar observations went well. At phase 68% the terminator is well positioned for seeing Rupes Recta (The Straight Wall) and its surroundings. In fact, the results (a sample given below) are some of the best we have ever achieved of this feature using a small telescope. It should be noted that this is a fault in the floor of the mare and not a wall as such (“cliff “would be more accurate in common parlance ). The crater to the left of the fault is BIRT. 2014 January 09, 19h 50m UT. 100mm f/9 apoochromatic refractor: 20mm eyepiece: Canon IXUS310 digital camera. (Low zoom.) Left click to enlarge. 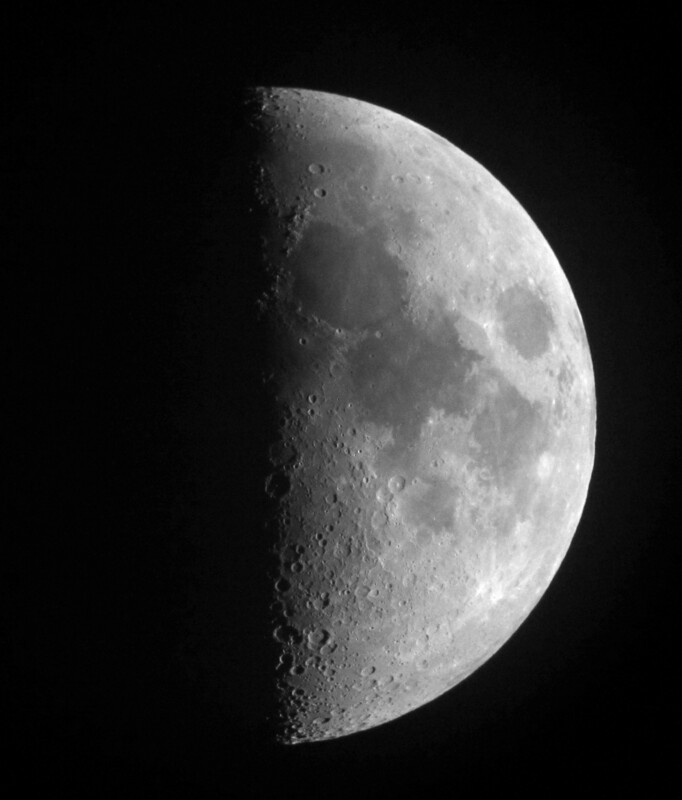 2014 January 09, 20h 24m UT.100mm f/9 apoochromatic refractor: 12mm eyepiece: Canon IXUS310 digital camera. (Full zoom.) Left click to enlarge. Rupes Recta is situated in the Mare Imbrium. Data for this and other futures proximal to the “wall” are tabulated below: the reader may gauge the resolution of this image from the data. East bank of Mare Nubium. a small mountain to the South. Slope inclined to 7° only. Slope covered with bright materials. 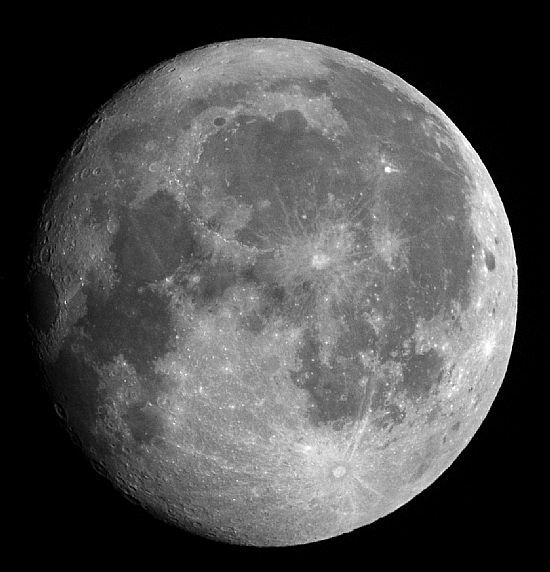 This term Rousay School pupils, as part of their space studies, will be making observations of the Moon’s apparent motion/phases etc. We will include from time to time their comments along with some images we have taken at Springfield. 2013 February 25: Full Moon! 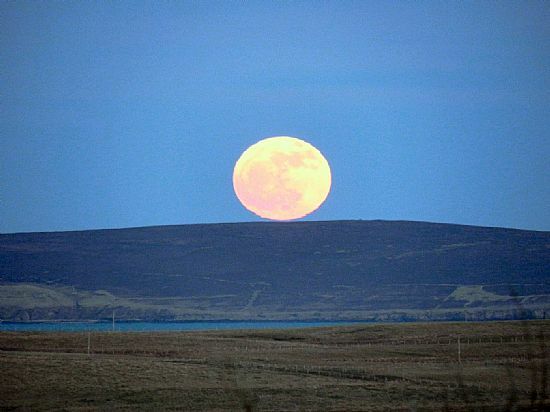 The “flattened”, rising full moon “sitting” on the hills of Eday as seen from Springfield, Rousay 2013 February 25th at 17h 47m UT. The flattening effect is due to refraction by the Earth’s atmosphere which, at this low altitude (54 arc-minutes), appears to raise the lower limb to a significantly greater altitude than the top limb. Full Moon occurred at 20h 26m UT on February 25th. The phase was 98%. Not full, then? No, but as close to full as was possible within this lunation. Careful examination of the image will show shadowing at certain regions of the Moon’s limb. 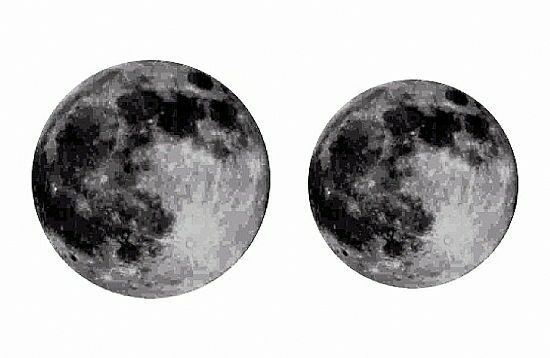 To be “absolutely” full, the Moon would be opposite the Sun in the sky as seen from earth and in the same line and plane, in other words a total lunar eclipse. The full significance of these variations will be featured in an article to appear next month. 2013 February 18. Daylight and Evening Observations of the Moon. 2013 February 18, 16h 24m. 180mm Maksutov 80x:. F200 Minolta. 2013 February 18, 18h 13m. 180mm Maksutov 500x:. IXUS 310HS. Very large formation. Second lunar “sea”. 830 000 km2. Very flat floor with numerous wrinkle ridges to the periphery. Note also the sunlight catching the upper east wall of the large circular crater Plato.. Pretty steep slopes supporting Platon G to the East. Few high walls with 2000 m summits and a colapsed part to the West. Immense flat floor filled with sombre lava. Clear spots and craterlets. 2013 February 17 19h 24m UT. 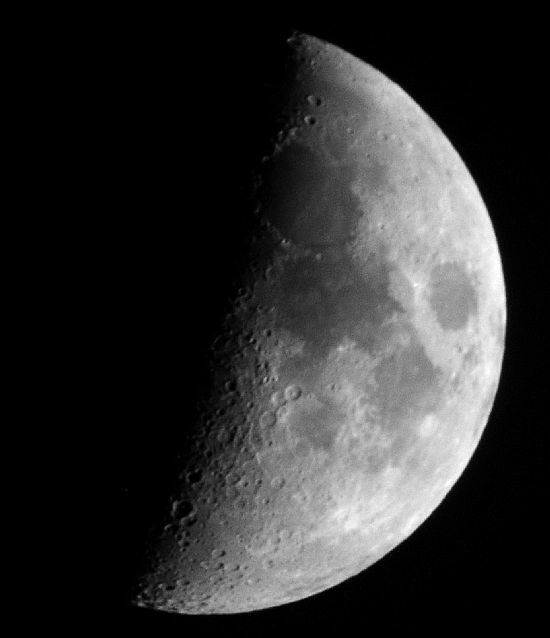 Maksutov 180mm f/15. power 85x: Canon IXUS 310HS, exp. 1/500 sec. ISO 800. 2013 February 17 19h 28m UT. 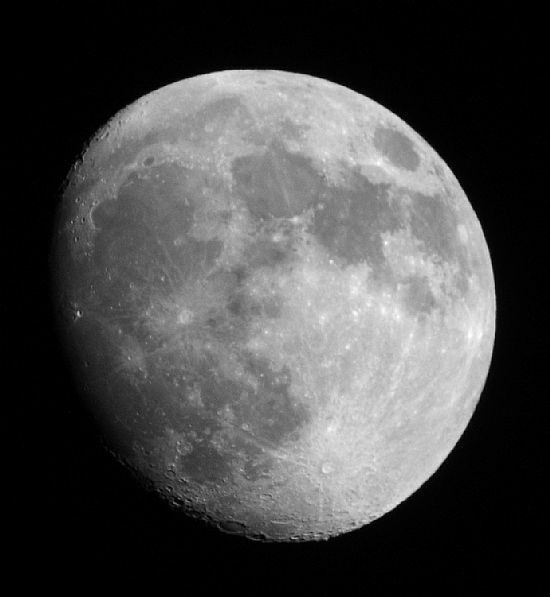 Maksutov 180mm f/15. power 150x: Canon IXUS 310HS, exp. 1/500 sec. ISO 1000. 2013 February 17. Maksutov 180mm f/15. power 150x: Canon IXUS 310HS, exp. 1/125 sec. ISO 1000. Immense flat floor with Faraday N lengthened to the East. Craterlets. Somber stains. Note: Air stability (“seeing”) was good, but transparency poor for these observations. 2013 Feb. 11, 18h 02m UT. 100mm achromat. 45x: 1/20 sec ISO 400 Minolta Dimage F200. 2013 Janaury 28, 22h 43m UT. 150mm f/15 Maksutov. 2013 Janaury 28, 22h 52m UT. 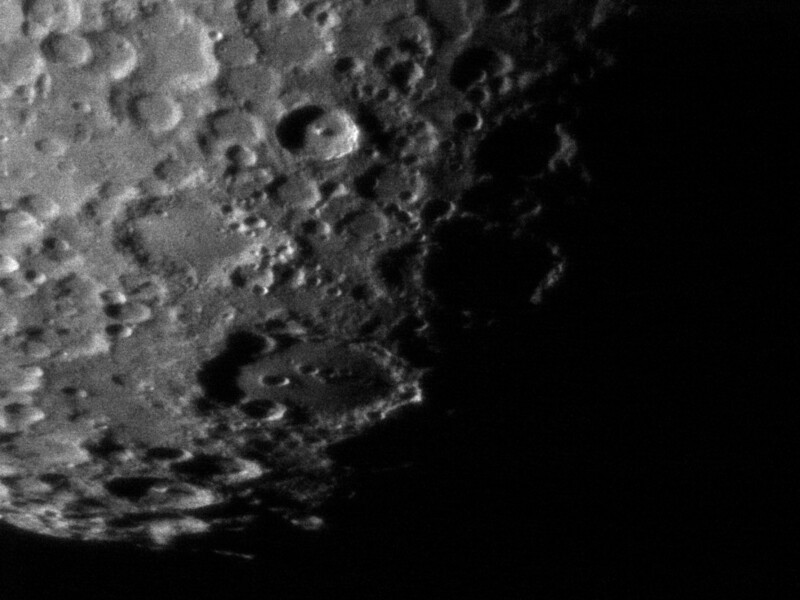 150mm f/15 Maksutov.showing Marium Crisium region. NOTE:The above two images are laterally inverted. 1 The regular, eliptal dark area on the terminetor known as Mare Crisium (Sea of Crises). craters to the south. Craterlets. 176 000 km2. 3.85 billion years old. 2 The bright, rayed crater on the eastern limb named Proclus. 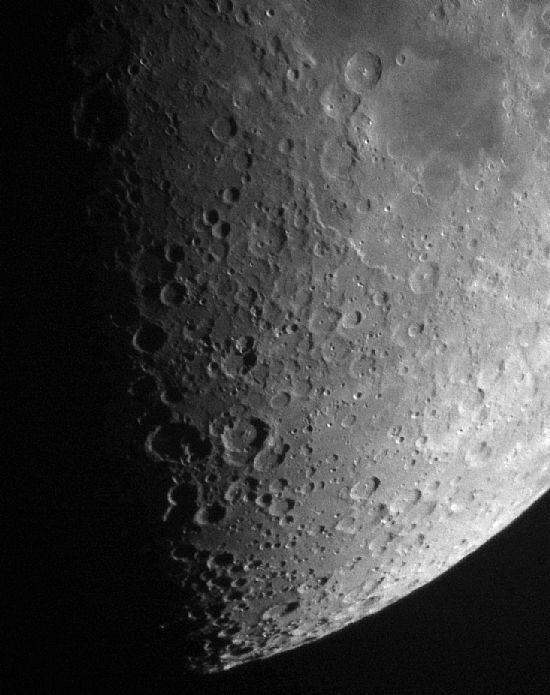 This is one of the brightest craters on the Moon. Important Facts: Director of Neoplatonician school in 452. Authors of the 'Elements of theology'. There will be a special feature on full Moon shortly. 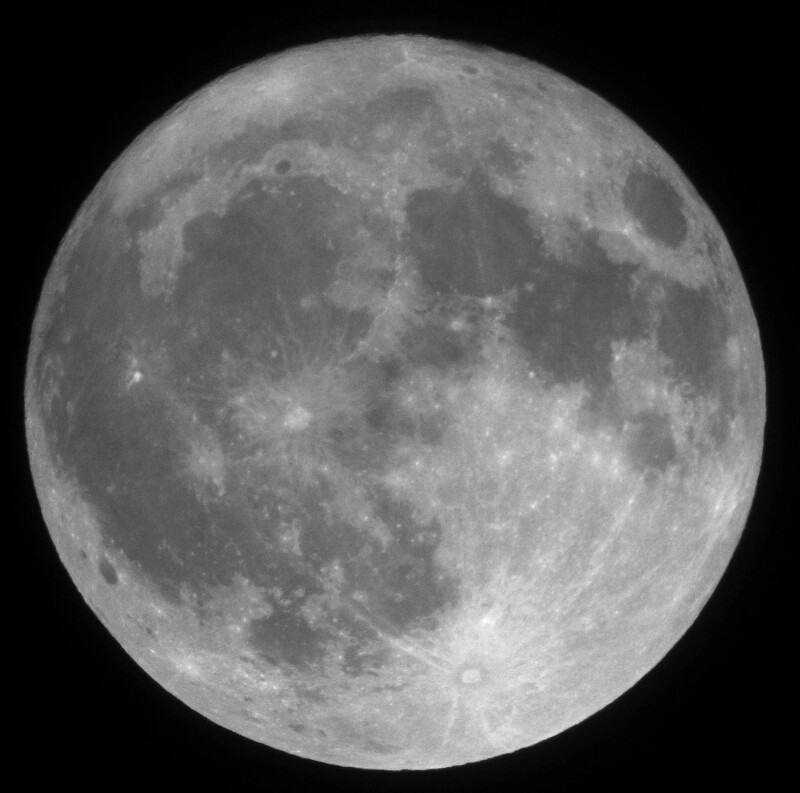 2013 January 27, 21h 08m UT: (16h 30m past full Moon). 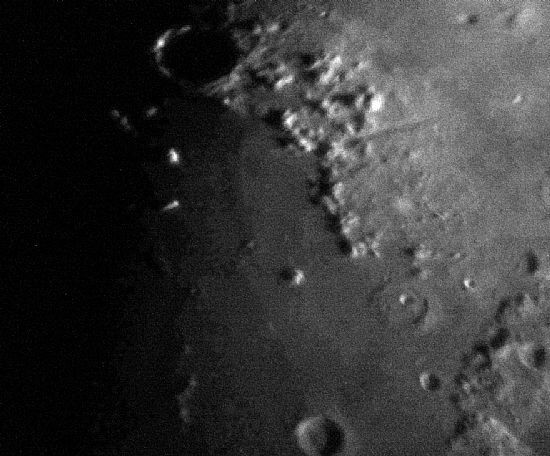 Note the brilliantly lit eastern wall of the crater Aristarchus on the terminator. Important Facts: Inventor of the heliocentric theory and a method of distance calculation of the Sun and the Moon. 2013 January 21, 21h 12m UT. 100mm achro..
2013 Janausy 20, 18h 51m UT. 100mm Achromatic refractor. 2013 January 18, 17h 40m UT. 100mm achromatic refractor. 2013 January 17, 16h 44m UT. 180mm f/15 Maksutov. 2013 January 16, 16h 44m UT. 180mm f/15 Maksutov. 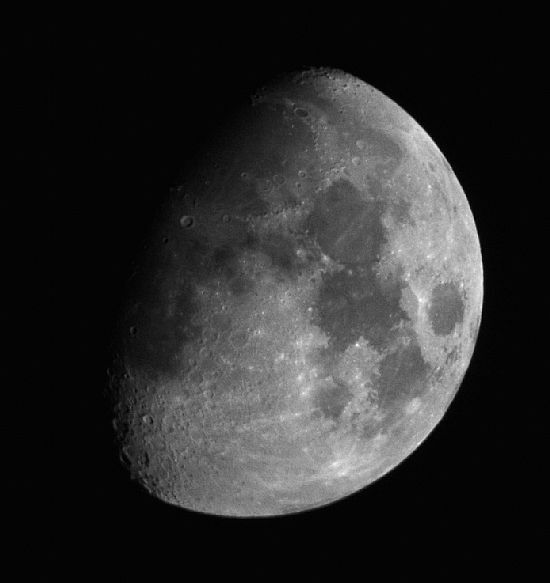 Instrument: 180mm f/15 Maksutov, Camera Canon IXUS 310HS (exp. 1/200 sec. ISO1600. 2013 January 14: The "ageing" New Moon imaged at 17h 12m UT. 100mm achromat. 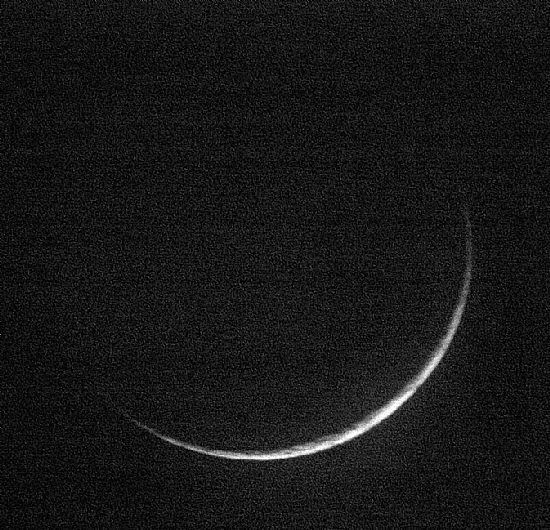 A companion to the image below (2012 December 10) which shows the Moon heading into "old age" at the other end of the lunar phase cycle - the lunar month. 2012 December 10: Commencement of the LUNAR early morning "run" passing planets Saturn. Venus and Mercury. Moon imaged 2012 Dec. 10 at 07h 05m UT. 180mm f/15 Maksutov: Minolta F200 at the eyepiece (56mm wide angle). Left click to enlarge. Morning Sky 2012 December 10. We were fortunate in having a relatively clear early morning on December 10 with the “silvery” crescent Moon appearing below Saturn with, at various intervals between scattered cloud breaks, views of Mercury Venus and the bright, white star Spica (above and to the right of the Moon). 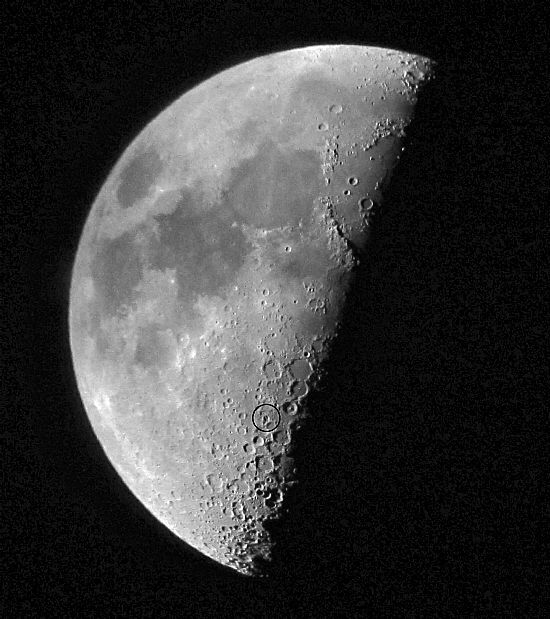 The Moon presented an interesting spectacle with the crater Reiner on the terminator and looking like an intense black “dot” (on small images) in contrast to its surroundings. (Location approximately mid-terminator). Additionally, there was a grazing occultation with the star eta Virginis (Mag. 4.8 to 5.0) at 07h 10m UT that showed well in small telescopes. 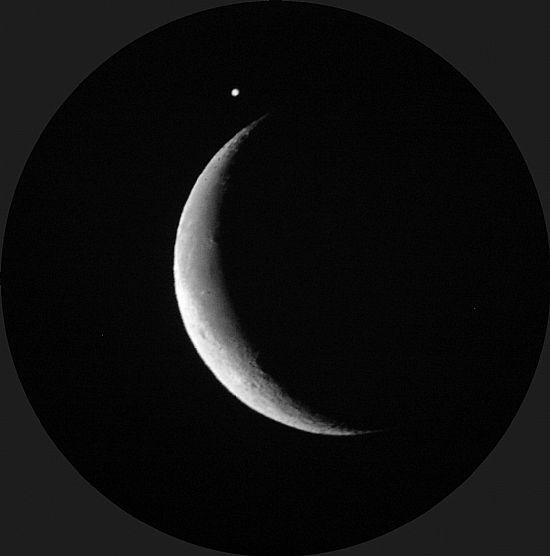 Jupiter in close conjunction with the Moon, 2012 July 15 at 02h 09m UT, approximately 10 minutes before closest approach (cloud prevented imaging at this instant). Considering the recent continuous cloud cover we were fortunate to see the event, which we did over a period of over 1 hour. See GALLERY page. The interesting crater formation DELAUNAY. 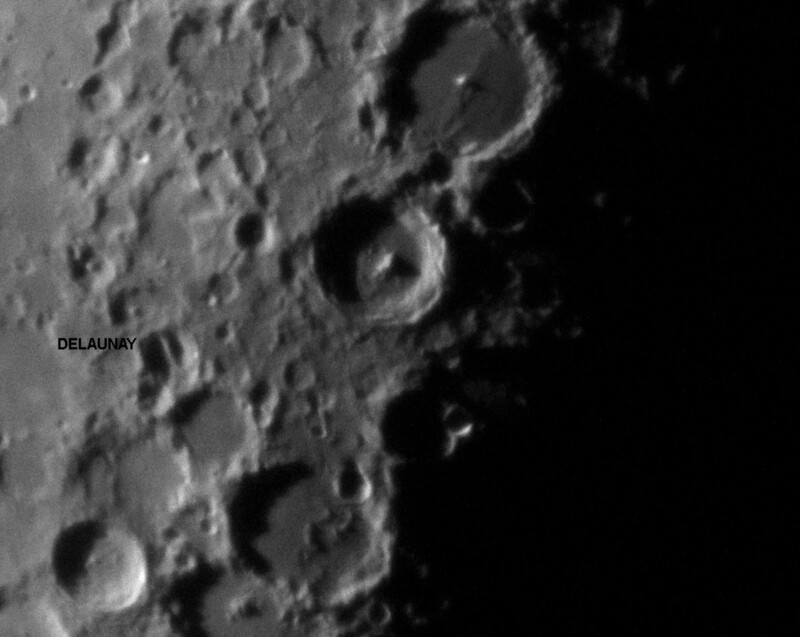 Location for crater DELAUNAY (ringed). An inspection of a table for the Moon’s perigee in 2012 reveals that the event on May 06 has our natural satellite at a distance of 356955 km compared to 369886 km on Jan 17. This equates to an apparent diameter for the Moon of 33' 28" and 32' 18" respectively. Interesting in itself, but when one looks more closely at the data for May 06 we find that Full Moon occurs within less than 2 minutes of perigee itself. One should state before we go any further that modern Lunar Theory has advanced considerably over recent years thereby rendering it possible to make predictions over a substantial period of time that would have been impossible 100 years ago. Figures in brackets are from Jean Meeus himself. The concordance will be seen to be very good. In my analysis the original table of concordances for the 221 year period amounted to over 300 hundred entries with differences in the two events amounting to no more than 10 hours. The five dates given in the above table stood out from the rest indicating that the 2012 May 06 is exceptional by any standard. 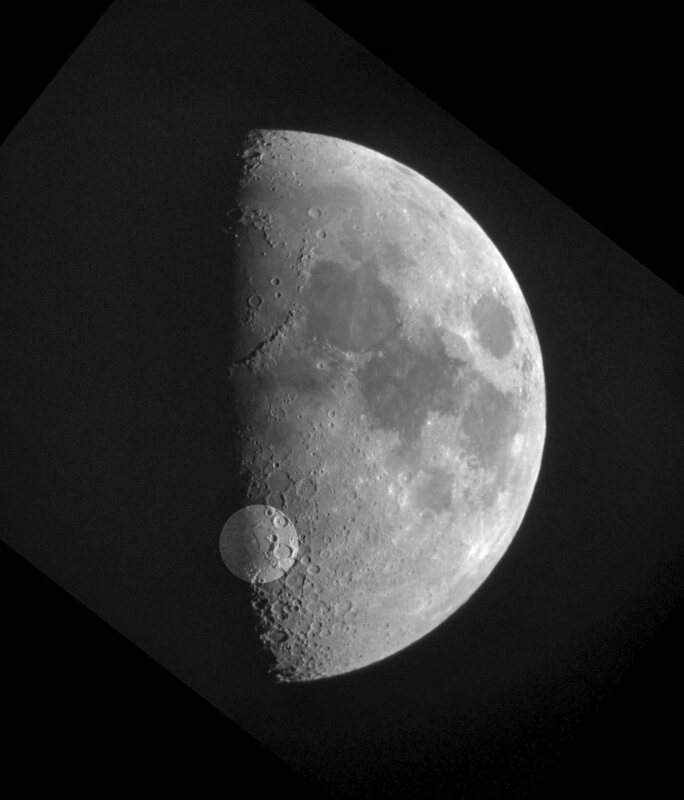 The fact that on 2012 May 06 as seen from the UK the Moon will be in a twilight sky, and within an hour of setting, is to an extent unfortunate but insignificant compared to the juxtaposition of the two events themselves. I should like to thank Jean Meeus for his prompt and helpful input to this investigation. Appearance of Full Moon at Perigee and Apogee compared. “Larrieu’s dam” imaged 2011Oct. 16, 03h 56m UT. Area within square shown (above) and below in high magnification with the "dam" ringed in the second image. The conditions were far from ideal at the time for, despite the moon being high in the sky, the seeing quality was poor with extreme dew level causing fogging of lenses in a very short space of time. Crater Clavius and surroundings 2011 April 12, 20h 15m UT. 120mm apochromatic refractor through the eyepiece with Minolta Dimage F200. Comparison between images recorded through the eyepiece using a Minolta Dimage F200 camera and a Nikon D300 SLR at the prime focus of the same instrument - a 120mm f/7.5 SkyWatcher apochromatic refractor. 2011 January 16, 17h 15m UT. Dimage F200 through the eyepiece at 45x. 2011 January 16, 17h 28m UT. Dimage F200 through the eyepiece at 90x and 3x optical zoom. 2011 January 16, 17h 34m UT. Nikon D300 SLR at the prime focus. 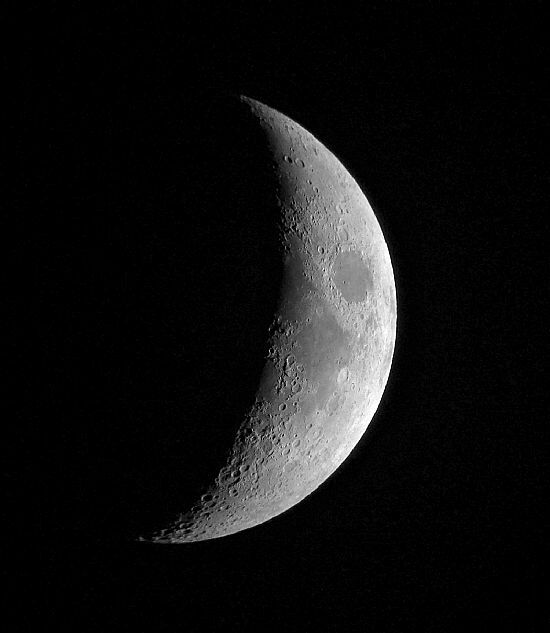 Interesting comparisons using a) A 100mm f/9 apochromatic refractor, the Moon imaged through the eyepice using a Minolta Dimage F200 at ISO 100. Magnification 80x, shutter 1/50 sec. a) 2011 January 09, 17h 19m UT. and b) Nikkor 600mm f/4 with 2x converter, ISO 800 at 1/400 sec. D300 SLR. 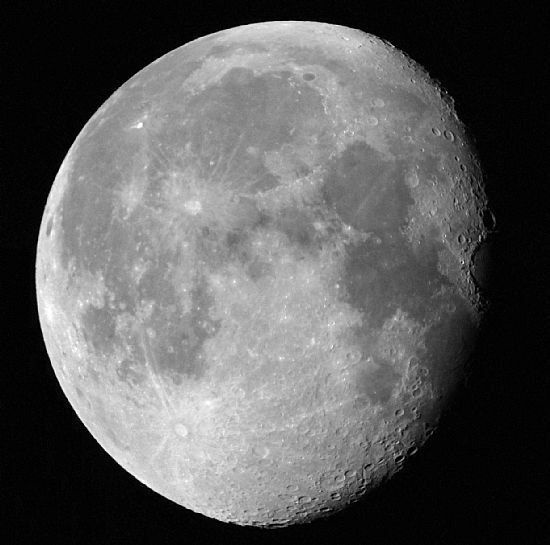 The Moon, imaged in poor transparency, 2010 December 26 at 07h 29m UT. Nikkor 300mm f/4.5 with 2x converter D300 in monochrome. Exposure 1/640 sec. ISO400. Note: comparatively little camera shake using the MC-30 cable connection for shutter activation. 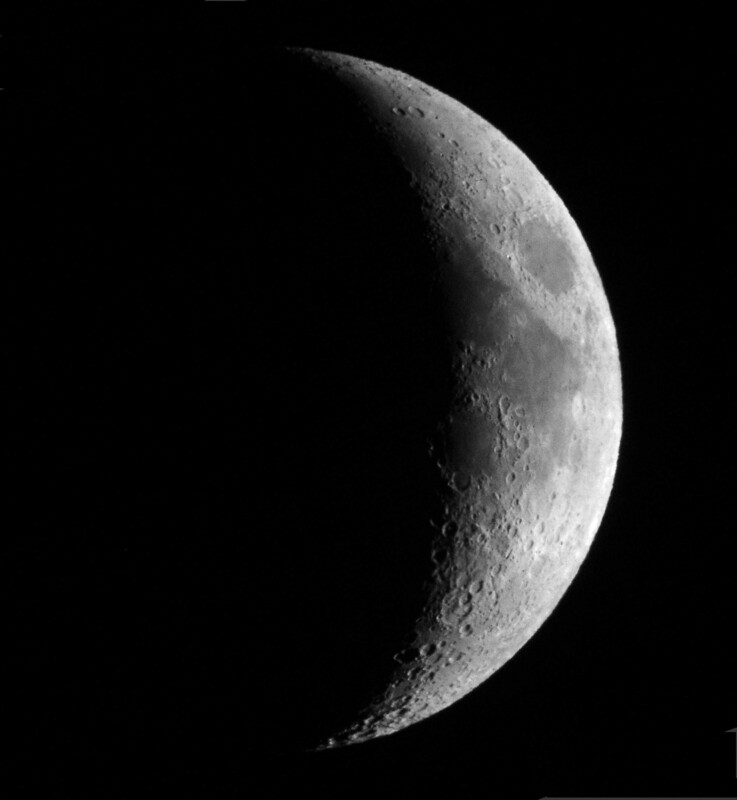 Even so, this image is inferior in terms of sharpness to that obtained with a 80mm f/7.5 apohromatic refracting telescope imaged through the eyepiece using a Minolta Dimage F300, the finest camera ever produced for this technique and long unobtainable except via S/H sources. The F200, with lower resolution than the F300, is also a fine camera and has the advantage of a more responsive shutter activation. 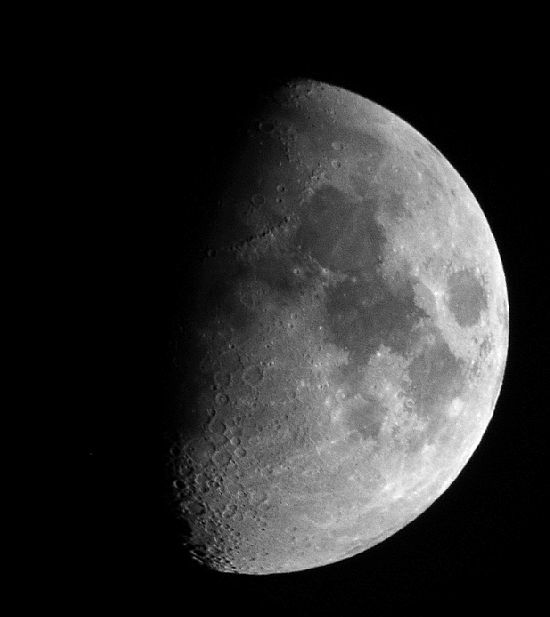 The Nikon D300 works well at low ISO values, both for lunar work and star fields. Anything above ISO800 gives unacceptable noise levels difficult to eradicate even with the NR camera processing. This camera provides a plethora of settings most of which are unsuitable for astronomical work involving exposures longer than 1 second. This matter will be treated in greater detail later. Moons and Satellites—a little matter of Nomenclature. 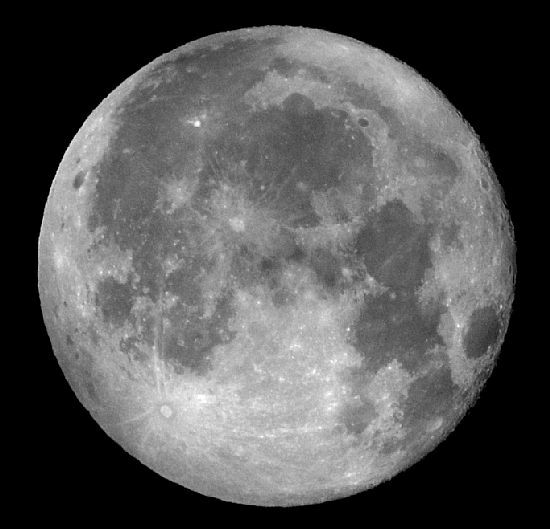 We shall reserve the word "moon" for the Earth’s natural satellite. Any other item in orbit about the Earth will be referred to in general as an artificial satellite to the Earth. Similar objects in orbit around other planets of the Solar System will likewise be named as artificial satellites to the body in question. Man-devised vehicles in orbits around the Sun will be variously referred to as probes, space vehicles etc., depending upon the mission (another word frequently to be found in contemporary space science/technology usage). As we are dealing with word usage it should be pointed out that in general the Moon and the Sun have a capital letter, even though some might argue that the preceding definite article (the) is qualification in itself. In astronomy we have become more aggressive (assertive?). Thus, we now "target" objects rather than "study" them; we "patrol" for rather than "search" for hitherto unknown items, and so on. And of course some will insist that it ALL started with a bang*! Why this display of pedantry? Put it down to a whipping I had at school from the science master when I had said something on the lines of "the moons of Jupiter". His approach was that "no student of his should use such baby talk." See: Big Bang - Fact or Fiction?